Blount, Russell W., Jr. The Battles of New Hope Church (Pelican Publishing Company, 2010). 192 pages, illustrations, maps, notes, bibliography. ISBN: 978-1-58980-748-8 $25.00 (Hardcover). The individual battles of the Atlanta Campaign continue to get more attention, and that’s a good thing. Although I bought this book several years ago, I picked it up and read it as a result of my recent look at Earl Hess’ book on Kennesaw Mountain. I wanted a glimpse into the fighting which preceded that more famous battle as well as to read Russel Blount’s book on Kennesaw for comparison purposes. Enter The Battles of New Hope Church, an entry level look at the fighting in the “Hell Hole” southwest of Allatoona in late May 1864. Blount’s book does a decent job of introducing readers to the fighting, but the awkward use of present tense and generic descriptions of the key players leaves something to be desired. Russell Blount has a B.S. in History (South Alabama) and taught the US Civil War as a high school teacher. He is a member of several Civil War related organizations including the Civil War Preservation Trust, Historic Mobile Preservation Society, and the Sons of Confederate Veterans. Blount’s other book, Clash at Kennesaw: June and July 1864, was also published by Pelican. The operations in “The Hell Hole” in late May 1864 came about because William Tecumseh Sherman wanted to bypass Allatoona Pass, a strongpoint he was familiar with from his time spent in the area prior to the war. He decided to move his large army group west, away from his precious railroad, the sole way to keep his men supplied. Once Johnston realized what Sherman was doing, he rushed men southwest from Allatoona to again block Sherman’s path. Once Johnston did so, the rough, wooded terrain effectively aided him in his efforts. The end result was a series of three small but bloody battles in the wilderness, ending in stalemate but resulting in Johnston’s eventual retreat east to Marietta and ultimately to another strong point at Kennesaw Mountain. Sherman had successfully bypassed Allatoona. The first thing to note about The Battles of New Hope Church is the author’s decision to use present tense, presumably because Albert Castel’s campaign study Decision in the West did the same. The result is less than ideal and causes some additional work to get through the text. Note to prospective authors: please don’t do this. It barely worked (in my opinion) for Castel. It won’t work at all unless you are an extremely good writer. Tense aside, the book is a solid introduction to the fighting at the Battles of New Hope Church (May 26), Pickett’s Mill (May 27), and Dallas (May 28). Confusion, mistakes, and costly frontal assaults on both sides ruled the week in the thickly wooded and difficult landscape. At 156 pages of text scattered with illustrations and maps, Blount doesn’t go into a great amount of detail. Compare this work on the three battles with Brad Butkovich’s 160+ page effort solely on the Battle of Pickett’s Mill, for instance. That stated, readers will gain a better appreciation of what Sherman was trying to accomplish and how Johnston tried to thwart his efforts in a greater amount of detail than any prior book on the subject. That alone is worth purchasing this book. Only two maps, one for Dallas and Pickett’s Mill, another for New Hope Church, are present. These are taken with permission from William Scaife’s earlier work on the Atlanta Campaign. While the maps are detailed, they are difficult to read in this particular implementation, but they do sometimes go down to the regimental level. Blount relies mainly on published primary and secondary sources, though he did do some original research at several research institutions, including several which contained papers by Sherman. Another issue is the author’s reliance on well-worn “truths” about key players such as Sherman, Johnston, Hood, Howard, and others. In some cases new scholarship has called into question some of the details the author provides about these key generals. 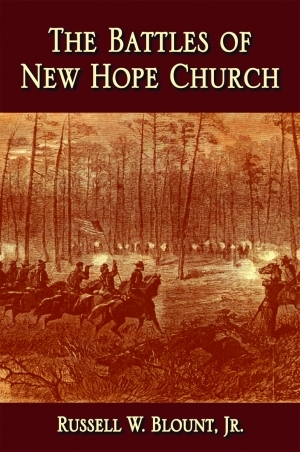 The Battles of New Hope Church is another addition to the growing list of books to focus on one or several battles of the Atlanta Campaign, a welcome trend. While it isn’t a definitive book, it does give readers a more detailed look at these battles than ever before. Readers will have to decide if the present tense style is too much of a bother to make the book worth their while. It was an irritant for me personally, but I became accustomed to it eventually. Anyone interested in the Atlanta Campaign, Sherman, Johnston, or local historians in the area will want to purchase this book. It is a solid if not spectacular look at one of the ongoing mini-campaigns within the Atlanta Campaign which until now has not been adequately covered. This book was bought by the reviewer for the purposes of this review.